>>featured interviews: *journalism: Kia Mistilis // Journalist, Photographer, Editor. 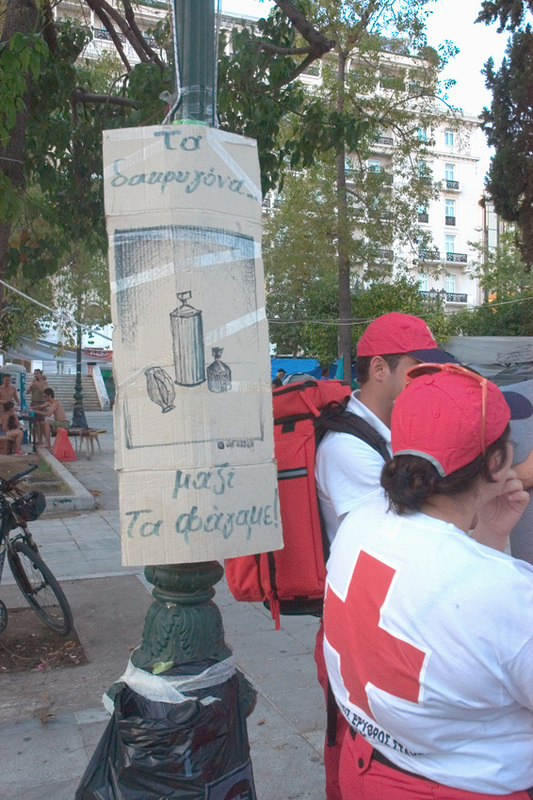 *journalism: Medical volunteers - Syntagma Square first aid station. DeputyPM, Mr Paaggelos said in 2010, that everyone in Greece is repsonsible for the economic crisis: "We all ate it (the money) together"
These are the full and unedited interviews I conducted with four medical volunteers from the first aid station in Syntagma Square. They have shared their stories from the Athens demonstrations of June 28 & 29, 2011 - an historic 48 hour general strike, called to protest the passing of the medium term austerity bill. On June 29, medical personnel at the first aid station and the Greek Red Cross inside Syntagma Metro station, treated around 700 injured protesters and transferred 100 patients to hospital via the Metro. "People gathered in Syntagma square on Tuesday, June 28, were shouting anti government slogans, and they were peaceful. There was nothing happening that could be considered dangerous for anyone until a few masked men - who we suspect are undercover police - began to provoke the police by throwing water bottles and stones. The police responded by shooting chemical gas into the crowd, who were not doing anything provocative. I saw this clearly from the first aid station. The chemical gases caused acute laryngitis, chest pain, dyspnoea, and asphyxiation. Some doctors, who were part of the demonstration, saw the injuries being incurred and came to the first aid station to volunteer. We had very severe incidents of burns, head traumas, thorax injuries, and heart palpitations. On Wednesday there were more people demonstrating than on Tuesday. Masked men were being chased from Amalias St toward the square. There were groups of police at Amalias St and also Ermou St. They (the police) could easily have closed them off and apprehended them. But they did not. Instead, the police opened up a passage for the se masked men to enter the Square. Once the men were inside the crowd, the police attacked the whole demonnstration with stun grenades and a lot of chemical gas. They were throwing so many CS canisters that we could not breathe normally, so I took a megaphone and went out and declared: 'we are a medical station, I, myself am Dr Kiriakou, pulmonary specialist. Please, I ask all of you to respect the first aid station.!' The police responded by throwing canisters of asphyxiant gas (concentrated CS gas) directly at both entrances of the first aid Station, as well as stun grenades - one landing half a metre from the oxygen tank. The chemical clouds were dense by this stage. As a human being I wanted to run, as a doctor, I chose to stay. We put the patients face down on the ground, and we lay our bodies over them, to protect them, and some of us fell unconscious, for a time. Eventually, we had to evacuate to the Metro station, where the Greek Red Cross were. But this had to be done in the middle of a battle, we could not even breathe properly, or see. It took a long time to transfer all the patients, there were 7 to 10 serious casualties. Up until the evacuation began around 5:30, I had seen about 200 people. We moved the last patient with the Red Cross rescue team who were bearing the stretcher, and a cardio-vascular specialist. We were struggling to breathe ourselves, and virtually blinded by the clouds of gas. The rescue team asked me which entrance we should use into the metro. I suggested we go past the Police, because we have visible first aid and Red Cross ID. As we approached the entrance, the riot police started shouting: “Put him down!” then they picked up rocks from the ground and started throwing them at the legs of the Red Cross stretcher bearers! Before we managed to enter the Metro, one was hit and injured by a rock thrown by a riot policeman. The other doctor quickly took the stretcher-bearer’s place, and I helped carry the injured Red Cross man. The riot policemen who threw rocks at Red Cross personnel bearing the stretcher of an injured person should be under psychiatric treatment. This has nothing to do with politics. I have three children and grand children. How do you think I feel about their future in such a community? Even in the heat of battle during war, no one comes to attack medical personnel or the injured! Even with the mafia in the 1920’s in America, when they saw the Red Cross or a cortege in the street, they put down their weapons and took off their hats. I say to the Greek police: Please do the same! I am ashamed to leave my children and grand children in such a civilization – if you can call it that. I think they (the Greek police) allow masked men – the provocateurs - into the square as a pretext to attack citizens. Why don’t they arrest them? Look, if police are trying to apprehend a thief in a public place, do they shoot indiscriminately into crowds? No, they do not! So why do the Greek police behave like that here? Once we had finished the evacuation, the riot police also threw chemical agents inside the metro station, right outside the door of the Greek Red Cross room. In the late afternoon and evening, about 15 doctors and 15 to 20 nurses arrived by Metro to help us. They were all ages, from young to elderly. They brought medicine with them and we worked together until just before midnight. Protesters suspected that our last patient was an undercover cop and this created a tense atmosphere. When we transferred him by stretcher onto a metro train, we (medical personnel) formed a chain, a human column of protection, to ensure he got safely onto the train. We provided medical assistance to all our patients equally, because that is our duty. We came back to Syntagma Square on Thursday morning and found the first aid station destroyed, but we cleaned up and immediately re-established it. We do not allow anyone to force us to leave our medical centre. So, we got it up and running straight away - for our dignity, in order to breathe again and to dream again for the future of our children." Unemployed doctor, currently writing his PHD in pharmacology. "I am here at Syntagma Square firstly as a protester and secondly as a medical volunteer. What we know about chemical grenades is that they contain CS gas and nitrates explosives. This explains the different colour of smoke that are visible when a CS canister is released. The explosive component are the carriers of the chemical gas. CS gas is a major lacrumont, which irritates the mucus membranes including skin, lungs, eyes, nose, trachea, and throat. Asphyxiant gas is CS gas in higher concentration. CS gas is known as tear gas, but it’s effect on the human body is much more than tears, so the term is misleading. CS gas has been widely used since the 50’s as a riot control agent. Between 2PM and 6PM on June 29, Greek police released 2860 chemical gas canisters at Syntagma, in a relatively confined space – a public square several hundred metres square. Even the wildest of riots does not necessitate such a large volume or intensity of chemical gases. The goal of the police attack was not to disperse ‘anarchists’ but to disperse the whole crowd gathered, including peaceful protesters, regardless of health or age. They wanted to get rid of the crowd in front of the Parliament and in the Square. The police closed all the roads to and from Syntagma Square around 5.30 PM, so there was no ambulance access. We repeatedly contacted the police commander in charge, requesting a corridor for ambulance access, and they repeatedly refused. We had to transport patients to hospital using the Metro, and that is very dangerous. There were several crimes committed on June 28 and 29, apart from how police behaved towards the whole demonstration, which was unspeakable. Several attacks were committed against the first aid station, which is a crime. Several attacks were committed on first aid staff, including doctors and nurses, which is also a crime. Police attacks on injured civilians - and not just in the first aid station is also a crime. The riot police also attacked the Greek Red Cross, who are protected under international laws and treaties. Our main concern was that we could not provide the best first aid and medical treatment as the chemicals also affected us. During the hours when Syntagma Square was being bombarded with chemical agents, we could not stay in a functioning state for more than one minute. We were also bombarded with marble stones, which the police threw directly into the first aid station, and directly at medical personnel. I witnessed police throw stones which hit two of our medical staff. In terms of improving this situation at future demonstrations, we do not have much choice, since the police refuse ambulance access and continue to use chemicals. Our biggest protection, the best way to minimise harassment is the mass of people willing to demonstrate peacefully. We (doctors and other medical personnel) will file a lawsuit eventually. We are in a war, it is not a war fought with armies and guns, but we feel the violence of the austerity measures, of being under the reign of the troika and the actual physical violence of the police. When you experience it, you know you it is war. We are trying to build an army of peaceful resistance, a movement of consciousness, for freedom and democracy." Barbara Doukas, first aid volunteer. “What happened today was really criminal. It was against the people and it felt like martial law. Riot police started attacking inside the square, and started throwing chemicals in both entrances of the first aid station around 4 PM. One of the canisters landed on the station’s tent wall, causing a fire. Luckily we had a fire extinguisher and managed to put it out. For one hour we were trapped inside, we could not see, we could not breathe properly. There were 20 medical volunteers, including doctors, nurses and first aid personnel, and 30 to 40 patients with respiratory problems or trauma wounds. We made repeated appeals to the Police; we were begging them to stop throwing chemicals at us. After some time, I went out and asked them for a corridor to evacuate the injured, but the police responded by escalating their attacks, continuing to throw many tear gas canisters directly at the first aid station. They were also throwing stones at us, and we had eye contact with them. I went back inside. While we were trapped, we felt a sense of panic. We were all on the ground inside the tent, with our faces to the ground. I was asphyxiated, I was blind, and I could barely breathe. After one hour we decided to evacuate by any means. We felt that the lives of our patients were at risk if we stayed there one minute longer. We transferred to the Greek Red Cross room, inside Syntagma Metro station. We were the only volunteer medical support in the square and the Greek Red Cross who were working in conjunction with us that day were there by invitation of the Metro. Shortly after we evacuated to the Greek Red Cross room, which is just inside the Metro entrance, the riot Police came to the entrance of the Metro and threw tear gas canisters at the top of the stairs, the bottom of the stairs and right outside the door of the Greek Red Cross station, contaminating the enclosed area of the Metro station. The Greek state had no provision to evacuate the injured to hospital. The government police closed the streets and then refused to open central Athens for ambulance access. If it were not for the Metro, the injured who had chemical burns, heart and respiratory problems and head traumas, (bleeding from head injuries) would not have reached the hospital. They were evacuated on stretchers via the metro, two train stops to Megaro Mousikis, where they were transferred by ambulance to hospital. If the Metro had joined the general strike that day, we would have had no shelter and no hospital access, because when the violence escalated, all exits from Syntagma square were blocked. The Metro remained open and this private company stood beside us when the government was absent. "During the riot Police attack on the first aid station in Syntagma square, I too went out to the street, near the corner of Filelinon and Metropoloeos Streets, and appealed to the riot police to stop the tear gas, but they continued. Then one of the riot police came forward and threw a stun grenade at me from a 15m distance. I was standing on a bench. If I had been on the ground, it would have hit me. Shortly after, one of the riot police stepped forward and threw a stone at me. I was on my knees, begging them to stop the tear gas attacks. They started throwing many stones at me, witnesses saw them hit my body, as I kneeled in the street. Around 5 or 5:30 PM, just before the evacuation, I went with a volunteer doctor the right hand side of the square, appealing again for the Police to stop the chemical gas attacks on the First Aid Station. The Police retreated a bit and then came forward, hitting us with their batons. Four people were hit: one doctor, one nurse (myself) and two first aid volunteers. They also threw chunks of marble stones and chemical canisters at us. I fell down and then they came from behind and beat my legs with batons. I could not get up, I could not walk, because at the same time I was being hit with stones and we were engulfed in a cloud of chemicals.